This article highlights the benefits of Cloud-IT for online grocery retailers. In grocery retailing there are many supermarkets in many locations. And there are a lot of special features for online trading. This means that the online grocery retail is very different from other industries. Apart from functional aspects such as ordering by weight, deposit handling or delivery at the desired time, there is a serious difference in logistics. For instance, postal dispatch is out of the question. Or who would like to have fresh ground meat in a packing station? Instead, grocery is delivered in refrigerated vehicles within a limited radius. On the one hand, to guarantee the quality and freshness of the goods. On the other hand, in order to increase the trust of the end customer through a transparent origin. As a consequence, every supermarket needs its own online shop. As well as its own online ERP system. This is the only way to ensure a clear separation of mandates. Each supermarket can also sell its own local products in addition to its regular product range as well as conduct local marketing. By contrast, there are only a few supermarket chains from the customer’s point of view. However, a closer look reveals that many supermarkets are run by independent merchants. These individual retailers demand solutions from their network. So that they can sell the grocery in their region online (e-commerce). And at this point a whole series of questions arise for the IT departments and their IT managers. Among other things, what advantages Cloud-IT offers for the IT areas. Actually, one should assume that the professional IT manager was only waiting for the Cloud-IT And he is also doing everything in his power to replace his classic monolithic IT systems with cloud IT solutions as quickly as possible. If one considers that the “Total Cost of Ownership” (TCO) is the basis of every decision for the IT manager, then everything speaks for it. On the one hand, cloud solutions usually require little or no initial investment and are stable and fail-safe. On the other hand, cloud environments offer excellent performance and scale almost infinitely. As a result, peak loads are no longer a threat and growth does not always require additional investments. In principle, the marketing and IT managers should become best friends. An other advantage of Cloud-IT systems, which should not be underestimated, is the possibility of agile development. With classic IT monoliths, there are only a few software releases possible per year. The Cloud-IT with microservices develops agile and installs new software without interruption. Especially in the still young discipline of online grocery retailing, it is invaluable when new features are quickly developed and tried out. If you assume a Scrum based working method with 2-week sprints, releases should take place at least every 2 weeks. If necessary, for example in case of bugs, changes can be made at any time. Then why are there still – albeit less and less – resentments towards Cloud-IT? And why are some people trying to defend their own on-premise operation of IT systems? At the beginning, is there a lack of understanding of the advantages of Cloud-IT? Are there any concerns that the data is not stored securely enough? Are there any concerns about losing control of the systems? Do you see the influence of the IT department dwindling by handing over tasks to specialized providers who operate the Cloud-IT? Anyone who deals with IT in general and Cloud-IT in particular knows that the vast majority of concerns are unfounded. Cloud servers from professional providers are at least as secure on the Internet as their own server in the basement of the company. The separation of data and mandates is a basic component of cloud operating systems. And last but not least, since the existence of IT, attempts have been made to bundle computing power and increase economies of scale.And if the architecture of the software running in the Cloud-IT makes it possible – especially when microservices are involved – then there are unbeatable advantages in scaling. But these are not the only effects on IT. With the increasing success of e-commerce, the IT department is gaining massive influence and its design options are growing strongly. At the same time, the responsibility increases dramatically. This concerns both the functional possibilities for online customers and the cost-effective processing of orders with retailers. As well as the many decentralized locations in the grocery retail sector and the resulting high number of clients. Furthermore, the smooth operation of IT systems is once again becoming the focus of attention. how do I manage the operation of >1000 standardized online shops and online ERP systems? how do I stay innovative and release new features for >1000 systems at least every four weeks without interrupting IT operations? how do I correct errors in >1000 online shops quickly? how do I deal with peak loads and handle >100000 orders per day before holidays such as Easter and Christmas? 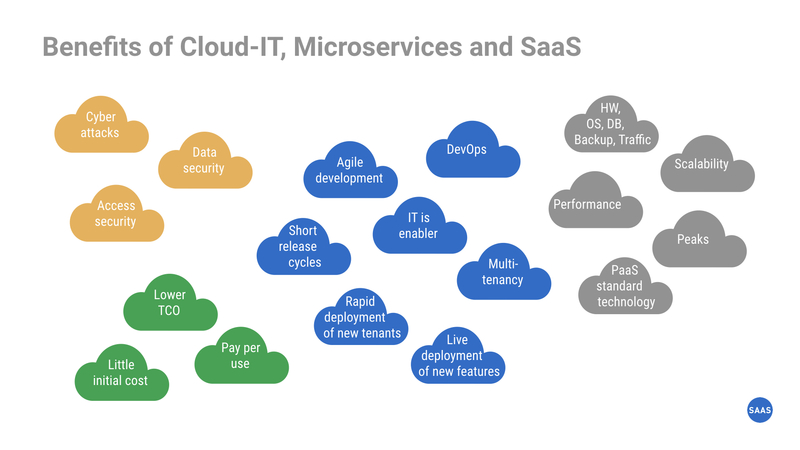 Cloud IT systems based on microservices offer a simple and convincing answer to all these and other questions: You simply bring it with you! The SAAS Grocery Commerce Cloud is the solution based on multi-client capable microservices that run in the Cloud-IT and scale as required. This means that every new supermarket brings positive economies of scale for the TCO. In addition to the business logic in the microservices, the online shop also runs as a multi-client capable “Single Page WebApp” in the cloud IT. In this way it is guaranteed that changes can be deployed without interruption and for all clients simultaneously. And because the economies of scale are so great, SAAS Software as a Service AG can offer its SAAS Grocery Commerce Cloud solution as “real Software as a Service” (SaaS): Virtually no initial investments and billing according to consumption during operation. By taking a closer look and considering all costs – especially the ” already there ” costs – the modern IT department recognizes the cost advantages of cloud IT. In addition, IT can take on a new and more complex role by opening up new possibilities for the online marketing of groceries. The Cloud-IT offers the IT department the great opportunity to transform itself from a pure implementer of requirements into a constructive business enabler for the entire company. Read the case study of our reference Grocer’s Cloud! Interested in the case study about our client NATURGUT?